Following on from his innovative photographic autobiography, Jimmy Page by Jimmy Page, we're excited to announce Jimmy Page's new signed limited edition for 2019, Jimmy Page: The Anthology. Selling out within six months of its release in 2010, Jimmy Page's first limited edition documented his life story in over 600 photographs he had handpicked during two years of research. 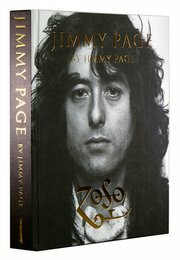 More details about the new publication, Jimmy Page: The Anthology, will be forthcoming. Register your interest here to be the first to receive future updates.